Elna-Jean Young Bentley’s three volume 1965 Ph.D. thesis (Emory University), is still the only full edition that has been produced of the immensely significant Formulary that Thomas Hoccleve produced for the Office of the Privy Seal in or around the early 1420s. The Manuscript upon which it is based, British Library MS Additional 24062, contains hundreds of templates for official documents (especially foreign correspondence) that flowed through the Westminster bureaucracy during the height of the Lancastrian regime. In the early 2000s, Helen Hickey, of Melbourne, Australia, transcribed the majority of Bentley’s edition of the Formulary into a FileMakerPro5 database in order to run search and sort algorithms on its content for her research. In 2015, Hickey submitted this file (long languishing on an old hard drive) to the Hoccleve Archive in the hope that it might prove useful for a future scholar, and might be built on. Although the file itself was not readable by any contemporary software, University of Texas honors alumna Juliette Sieve successfully converted the database into a Microsoft Excel spreadsheet. 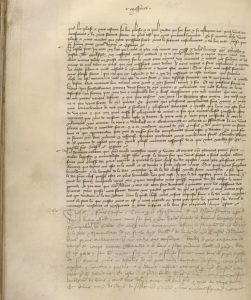 While the Hoccleve Archive has not yet independently verified the content of this database against Bentley’s dissertation or BL MS Additional 24062, we have posted it to our repository at Texas ScholarWorks HERE so that other scholars can work with the database independently. If you have raw materials for a project based on Hoccleve’s Formulary that you’d be willing to share–whether derived from this database or not–please reach out to us so that we can include your data in this collection!